Their focus is to create the type of wine they love to drink—rich, full bodied red wines. They make cabernet sauvignon, merlot, Malbec and blends as well as a 100% petite verdot which is a grape that is usully only used for blending. Each year they also have a Prima Nata. Prima Nata translates from Italian to loosely mean “first born”. 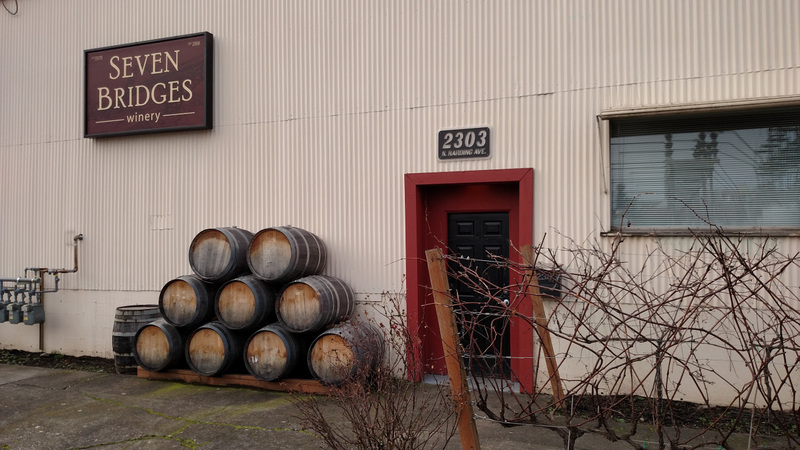 For them, the blend that most exemplifies the type of wine they want to make at Seven Bridges each year earns the designation as their Prima Nata. The blend will vary each year but represents what they consider to be the combination of wine produced from that vintage that brings out the best in each varietal with excellent balance and overall quality. The blend should not overly represent any of its components, rather it should represent a new entity only achieved by the combination of its parts. The name Seven Bridges was adopted to pay tribute to the spectacular bridges spanning the Willamette River that can be seen from the winery located in North Portland, specifically in the Lower Albina/Eliot neighborhood across the railroad tracks and Interstate Avenue. Producing about 2500 barrels a year the winery offers a wine club that includes regular shipments of wine to your door and invitations to events as well as discounts. For more information visit the winery at 2303 North Harding Ave. You can also find Seven Bridges wines at local grocery stores and restaurants.